Get an exclusive peak inside Zoe’s top floor East Village studio in New York where photography, sculpture, embroidery and neon are expertly engineered into various forms of art. 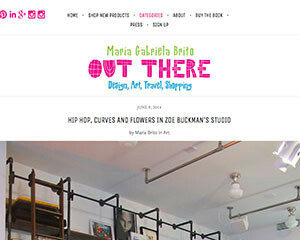 Maria Gabriela Brito sat down with Zoe to discuss her current projects: Present Life and Every Curve. I always have an elated feeling when I get to see the work of an emerging artist that is really promising. I fully subscribe to the words that I have said time and again: I never get bored or jaded of the art world, there is always someone doing something amazing. Zoe Buckman is one of those artists that elicited my curiosity and whose studio visit didn’t disappoint.